Promises 'stellar salvation for performance seekers'. 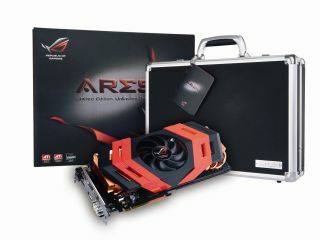 Asus' ROG Ares graphics card has been officially unveiled, promising 'stellar salvation for performance seekers'. The Republic of Gamers Ares card brings two Radeon HD5870 cores running at 850Mhz, with Asus promising an up to 32 per cent improvement on the reference card. "The astral design scheme belies overwhelming processing muscle," explains Asus. "Ares has 3200 stream processors and a cosmic 4GB of GDDR5 RAM clocked at 1.2GHz." "This is the kind of power gamers and hobbyists dream of, allowing even the most demanding applications to run fully unabridged while future-proofing for coming attractions, as it will be a long time before Ares finds itself taxed," the release continues. "It also serves as a superb anchor for overclocking aficionados building a benchmark machine, since the potential for tuning is enormous." The powerful card is cooled by a 100mm fan as well as 'two outsized oxygen-free, all-copper heatsinks and no less than eight 8mm copper heat sinks on the board'.